I have been sick since Saturday. What was supposed to be a fun weekend for Mario's birthday turned into The Weekend of Sickness, culminating in Mario getting food poisoning on his actual birthday (Memorial Day) and being absolutely miserable for a day and a half. Sometimes things don't go as planned... I am not feeling any better so today I decided that rather than struggling through another day at work and subjecting my coworkers to my drippy nose and frequent sneezing fits, I'd just stay home and sleep the day away. That is my plan. I just had to get up and feed the dogs so I thought I'd pop in here to let you know what's been going on. Then guess what happened? My SD card reader decided to stop working. I haven't been able to find my transfer cable for the fancy camera, so today you'll have to settle for crappy cell phone pictures of things I've been working on. My biggest news? 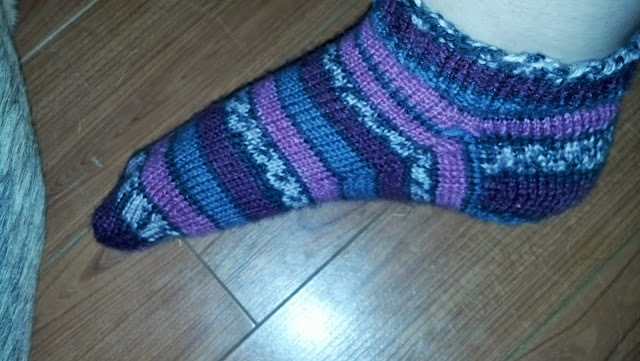 I FINISHED A SOCK. 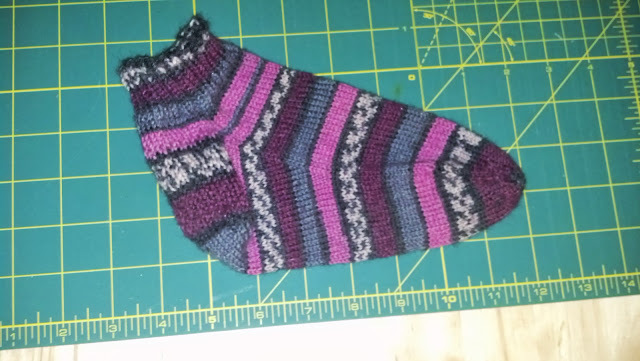 Not a super fancy sock, but it is functional and it fits and it has PURPLE on it :D I used these videos from Knitpicks to help me figure it out. Super clear step by step instructions to make a basic sock. Now I understand what things like "gusset" and "heel turn" mean and they aren't nearly as scary as they sound! I think now I might be ready to tackle something slightly more complicated from my Sock Knitting Master Class book. Maybe. Seriously terrible picture, I know. But I wanted to prove it fits! I have started work on the second of the pair... but I don't know if I'll have enough yarn to finish. Because this happened. My little demon puppy got a hold of the other ball and now it is hopelessly tangled... Probably my fault, really, as I left it on the couch. What else is a puppy to do with an unattended ball of yarn? It would be nice if she had picked it up and knitted the other sock of me... but I guess that's a little too much to ask. I have less than half of the first ball left and I was able to get some yarn from this tangled mess, so I might pull it off. 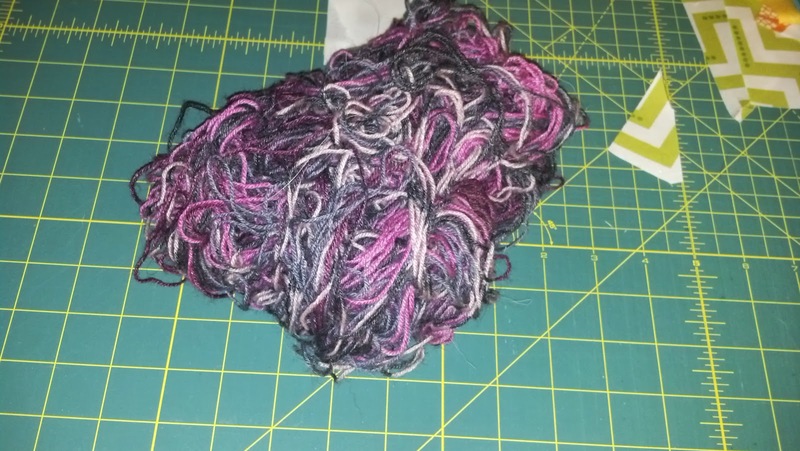 I got the yarn on clearance at Joann, though, and I can't find this color anywhere. Not that I even know what it's called because she ate the label, too... But I know it is no longer available at Joann either locally or online. So I'll see what I can do with what I have. If worse comes to worst, I will just pick up some gray or purple yarn and finish the toe with that. It's my first pair, so I'm not stressing over it too much. Okay. I've rambled enough. I need to go take some cough syrup and lay down for a while... Hopefully I will have some decent pictures next week. Oh yeah. There's still a day or so to vote for your favorites in each category in the Blogger's Quilt Festival! You should totally go do that! There are soooo many pretty entries! Yay I get to make the first comment :) I think the sock looks great and the colors of it are awesome as I love purple. 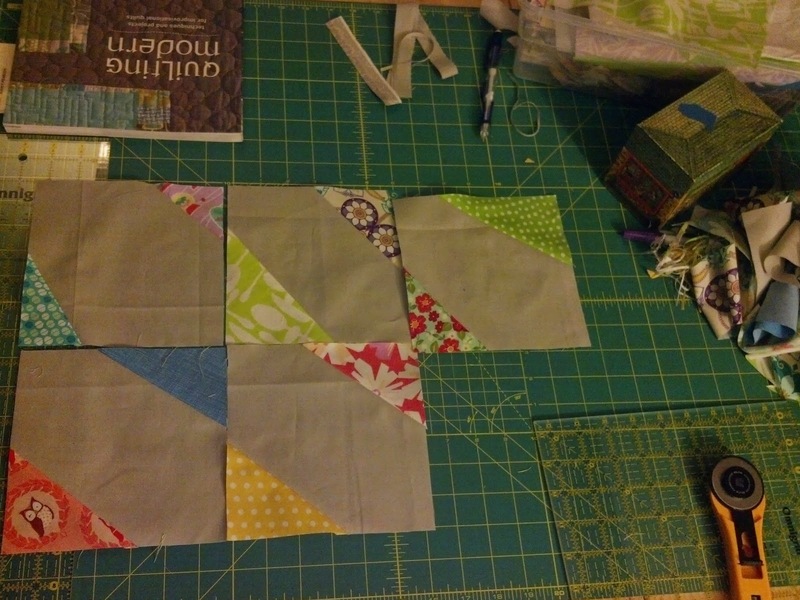 The stitch and flip triangles will also turn into something wonderful, I can tell. The owl fabric is so cute, and do you know what the blue-ish triangle is in the left block in the first row? I don't recognize it but it looks cute from the pictures, though so do all your fabric choices!